Charles Clarke is a college student who spent over 5 years to save up $11,000—only to have it seized by law enforcement officials before he was scheduled to board a flight at the Cincinnati/Northern Kentucky airport. Charles is one of thousands of Americans whose cash has been seized at an airport through civil forfeiture, which allows law enforcement to seize cash and property without ever charging anyone with any crime. In the winter of 2013, Charles visited relatives in Cincinnati while he and his mother were moving to a new apartment. Charles took the $11,000 with him to avoid losing it during the move. On his way home in February 2014, law enforcement officials at the airport seized Charles’ money. They claimed his checked bag smelled like marijuana, but found no drugs or anything illegal. The government kept his money for over two years and put the burden on him to prove that his money is legitimate. The government should have to prove that he had committed a crime, not Charles. In the late 1990s, the Cincinnati/Northern Kentucky airport police took part in a couple dozen seizures per year—but by 2013 that figure skyrocketed to almost 100 seizures, totaling more than $2 million. The Institute for Justice represented Charles in his fight to get his money back. In November 2016, in a settlement on the eve of trial, the United States agreed to give Charles back every penny of the $11,000 it seized from him, plus interest. As part of its nationwide initiative to end civil forfeiture, IJ has successfully represented property owners whose cars, homes, businesses and bank accounts have been seized through civil forfeiture. This case highlights a new, but underreported, aspect of “policing for profit”—law enforcement’s aggressive use of civil forfeiture to seize cash of domestic travelers at our nation’s airports. Carrying large amounts of cash is not a crime and law enforcement cannot treat citizens like ATMs. Police seized $11,000 from Charles, much of which was earmarked to pay his college tuition. Police seized his life savings without charging him for a crime. Now he’s fighting back. Charles Clarke is one of thousands of Americans whose cash has been seized at an airport through civil forfeiture, which allows law enforcement to seize cash and property without ever charging anyone with any crime. Charles Clarke is a 24-year-old college student. On February 17, 2014, Charles was flying home to Florida after visiting family and friends in Cincinnati. While he was waiting to board his flight, two law enforcement officers approached him at the gate. The two officers, an airport police detective and an officer of the Covington Police Department, serving as a deputized agent of the Drug Enforcement Administration (DEA), began to question Charles. They told him that his checked bag smelled like marijuana. Although Charles was a recreational smoker at the time, the officers did not find any drugs on his person, or in his carry-on or checked bag. Then the officers asked Charles if he was carrying any cash and he said yes. The government took and kept the $11,000 without charging Charles with, or even accusing him of, any drug crime. But in the upside-down world of civil forfeiture, the burden is on Charles to show that his money is legitimate. In the past five years, Charles had saved more than $11,000 in cash from financial aid, various jobs, educational benefits based on his mother’s status as a disabled veteran and gifts from family. Charles did not put all of his money in the bank because he preferred to use cash and his bank had few physical branches. He traveled with the cash because he and his mother were moving and Charles did not want the money to get lost while he spent time in Cincinnati. Under a federal program called equitable sharing, state and local police receive up to 80 percent of forfeiture proceeds in exchange for referring seized property to federal authorities. In 2014 alone, the Cincinnati/Northern Kentucky airport police received over $530,000 in federal forfeiture funds, the third-highest total in the state. 1 Under this program, 13 different law enforcement agencies from Kentucky and Ohio are seeking their cut of Charles’ money, even though 11 of those agencies were not involved in the seizure. Although earlier this year the Justice Department curtailed one of the most egregious aspects of equitable sharing after widespread criticism,2 Charles’ case and the behavior of law enforcement demonstrates why the policy changes are insufficient to stem the problem. Unlike criminal forfeiture, where the government takes someone’s property only after he or she has been convicted of a crime, police and prosecutors can use civil forfeiture to take the cash, cars and homes of people without ever having to convict or even charge the owner with any wrongdoing. This is because civil forfeiture cases technically are filed against the property rather than its owner, leading to unusual names such as United States v. $11,000 in United States Currency. Shockingly, law enforcement agencies can use the money that they seize through civil forfeiture to pad their budgets. That is a dangerous incentive for law enforcement officials to seize and try to forfeit more and more property. Carrying cash is not a crime and no one should lose their life savings when no drugs or evidence of any crime are found on them or their belongings. The burden should not be on Charles to prove that his money is legitimate. In order to keep his money, the government should have to prove that Charles committed a crime. Ordinary Americans like Charles are routinely asked if they are carrying any cash when they fly, drive or ride the train. As part of so-called “interdiction programs,” drug task forces aggressively use civil forfeiture to seize cash. For example, in August 2006, two professional gamblers had $97,000 of their seed money and winnings seized at the Atlanta airport by a Georgia police officer deputized as a DEA agent.3 After hiring lawyers and documenting the legitimacy of the seized money, it still took seven months before the money was eventually returned. var ctx = $("#108218438201").get(0).getContext("2d"); // This will get the first returned node in the jQuery collection. //String - A legend template legendTemplate : "
Seizing Americans’ hard earned cash is not limited to airports. In late 2014, an investigative series by The Washington Post, “Stop and Seize,” revealed that since September 11, 2001, state and local law enforcement have made 61,998 cash seizures through so-called “highway interdictions,” totaling more than $2.5 billion—all without any search warrants or indictments.6 “Stop and Seize” told the stories of many innocent Americans, including Mandrel Stuart, a 35-year-old restaurant owner in Virginia.7 Police took $17,550 from Mr. Stuart during a stop for a minor traffic violation. Although he was never charged with a crime, Mr. Stuart lost his business before finally getting his money back after a victory in court. And in a well-publicized incident in May 2015, the DEA seized $16,000 in cash from Joseph Rivers, a 22-year-old man who was switching trains at an Amtrak station in Albuquerque, New Mexico, while traveling across the county to produce a music video in Hollywood.8 Like Charles, Mr. Rivers had his life savings seized and was never charged with any drug crime. As these cases highlight, civil forfeiture incentivizes police to turn into profiteers. Law enforcement took Charles’ money because of a suspicion that it was the proceeds of drug sales, or that Charles intended to purchase drugs with it. The government has kept the money for more than a year without giving Charles the chance to explain where he got it. Until recently, Charles had to fight to get his money back without the benefit of a lawyer. Many civil forfeiture victims simply give up when they do not have representation. Often the amount of money or property that they are trying to get back is less than the cost of a lawyer. Charles was lucky enough to get free legal help for his defense, but most forfeiture victims are not so fortunate. Allowing law enforcement officials to keep money they seize encourages them to target ordinary people who prefer to use cash. That is why Charles is teaming up with the Institute for Justice to defend against the unjust attempt to forfeit his money and to challenge law enforcement’s ability to fund itself through cash taken from innocent travelers. In addition to proving that Charles’ money came from legitimate sources and has no connection to drugs, IJ will challenge the constitutional deficiencies of the government’s civil forfeiture program to protect all Americans who choose to carry cash. Unlike other self-financing agencies that collect fees or keep revenues from consumers, such as the U.S. 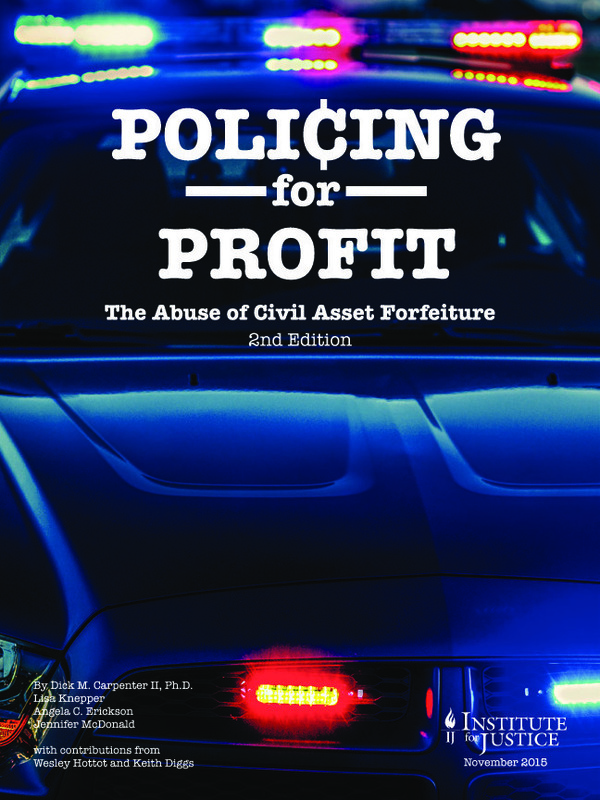 Postal Service or Amtrak, there is no commercial market for civil forfeiture. There are no forces of supply and demand to restrict profits, like the amount of mail the Postal Service handles or the number of travelers purchasing tickets on Amtrak. Here, nothing constrains a prosecutor’s discretion to take property from citizens who are not even charged with crimes, except ethical and judicial constraints—how much a prosecutor is comfortable with seizing and how much a judge permits. Consequently, this scheme allows an executive agency to self-finance its own activities, which is exactly what the Appropriations Clause exists to prevent. So long as law enforcement has a financial incentive to seize as much property as possible, with few limits on how an agency can spend the proceeds, forfeiture abuse will continue. Forfeiture proceeds must go into a general fund, so that Congress can control how they are spent. The litigation team consists of Institute for Justice Attorneys Darpana Sheth and Renée Flaherty and Institute Senior Attorney Scott Bullock. Christopher Wiest of Chris Wiest, AAL PLLC in Crestview Hills, Kentucky, serves as local counsel. The Institute for Justice is the national law firm for liberty and the nation’s leading advocate for property rights. Charles’ case is the latest in IJ’s nationwide initiative to end civil forfeiture and shines a spotlight on cash seizures in airports. The Institute has fought civil forfeiture on behalf of the owners of the Motel Caswell in Massachusetts,11 the owners of Schott’s Market in Michigan,12 the owner of a truck seized in Texas,13 the owner of a restaurant in Iowa,14 and convenience-store owners on Long Island15 and in North Carolina.16 In 2010, IJ published the landmark report on civil forfeiture, Policing for Profit,17 and in 2015, IJ exposed the IRS’s abuse of structuring laws in Seize First, Question Later: The IRS and Civil Forfeiture.18 For more information on IJ’s national initiative to end civil forfeiture, visit endforfeiture.com.